Awww! Thank you, Tamara! You're such a sweetheart! I have to say, YOU inspire ME! Happy, happy holidays (even if you do hate winter! LOL)! Wow Tamara! I had no idea you had a blog! This is so cool! I have so much to catch up on reading your older posts. 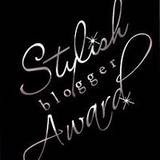 Thanks for the Stylish Blogger Award! It's really sweet! I hope you're having a wonderful Christmas in Saskatchewan! It's hard to find a good mascara. I like Maybelliene but I also use some Avon brands.